We specialise in decorating and supplying glassware and china used as sporting trophies throughout Australia - our clients love our work and we guarantee you will as well. Whether it's for basketball trophies or cricket trophies, Melbourne's trusted C. R. Hose Glassware provides beautiful, bespoke options for the events you wish to celebrate. With decades of experience, we will create a unique sporting trophy for your club. Whatever your sport is you will benefit from our range of quality glassware and china beautifully decorated for your club. We offer Australia wide delivery. Call C.R. 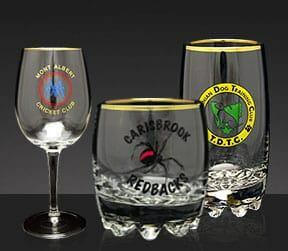 Hose Glassware today on (03) 9781 1966 to find out how we can help your club. Made from beautiful materials our golf trophies are the perfect award for winners of tournaments to be presented with. Custom-engraved to display the name of the golf club, event, and the winner, our golf trophies can be made for all occasions. Score a goal for your netball club by trusting the team at C.R. Hose Glassware. Accurate and competitively-priced our netball trophies reward Melbourne members of your netball team for their achievements on the court. Has your team won the finals? Has someone bowled a perfect game? Celebrate the memorable event in style with our exceptional bowling trophies. Complete with golden bowlers or ten pins on top, our bowling trophies will take pride of place on your mantle or in your display cabinet. Whether you are a bowler or batsman why not celebrate your club's win against a competitor with a cricket trophy? Our expressive and modern cricket trophies give Melbourne sportspeople the perfect award for the hundreds of hours they have spent tuning their bodies for the game. Show appreciation for the team's efforts on the court over the year with our basketball trophies. Melbourne basketball coaches and team managers can ensure that hard work is recognised with our expertly-crafted and assembled sports trophies. At C.R. Hose Glassware we know that no two clubs have the same vision for their selected trophies. To guarantee that our customers receive the highest standard of satisfaction we proudly supply beautiful custom-made trophies at a competitive price, allowing sporting organisations to celebrate their achievements regardless of their budget. To Find out more about our high-quality sporting club trophies get in touch with us today!